Listed here is a 1939 Chevy Blue Dot Taillight Lens made of glass. 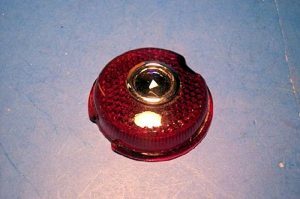 This lens is a reproduction of the original 1939 GM taillight lens, red in color. The blue dot in the middle is also made of glass. They fit very well and illuminate correctly. When deciding to use a blue dot lens, please keep in mind that technically they are illegal in many states. That is because when the blue dot is positioned correctly in the red lens and you apply the brakes the 2 colors blend and make the lens look purple. A brake light lens legally needs to be red not purple. Most cops will look the other way or use the blue dot as an excuse to stop you and look at your car. But they are technically illegal.